The Canal is once more in good navigable order, and transportation has been resumed. 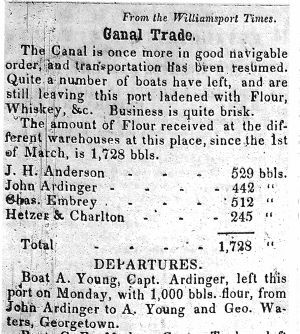 Quite a number of boats have left, and are still leaving this port ladened with Flour, Whiskey, etc. Business is quite brisk. The amount of Flour received at the different Warehouses at this place, since the 1st of March, is 1,728 bbls. J. H. Anderson - 529 bbls. Boat A. Young, Capt. Ardinger, left this port on Monday, with 1,000 bbls. flour, from John Ardinger to A. Young and Geo. Waters, Georgetown. Boat C. F. Mudge, Capt. Taylor, left this port the same day, with 1000 bbls. flour, from John Ardinger to J. A. Magruder and Geo; Waters, Georgetown. Boat A. Leiter, Capt. Ensminger, left this port on Tuesday, with 860 bbls, flour, 100 bbls. Whiskey, and 80 bush. Cloverseed from J. H. Anderson to G. Waters and J. A. Magruder, Georgetown. Boat I. Long Capt. Hoy, left this port on the same day, with 800 bbls. flour, 30 bbls. whiskey, and 314 bush, cloverseed, from J. H. Anderson to G. Waters, Georgetown.
? Mountain Ranger, Capt. Hetzer, left Wednesday, with 1182 bbls flour from Fetzer & Charlton, to J. A. Magruder, Georgetown. Boat W. T. Hamilton, Capt. Embrey, left this port on the same day, with 1135 bbls. flour, from Chas. Embrey to Geo. Waters, Georgetown. Boat J. R. Annan, Capt. Ensminger, left this port today (Thursday) with 1000 bbls. flour: from J. H. Anderson to Geo. Waters, Georgetown. Boat W. J. Booth, Capt. Hetenhouser, left this port the same day, with 1000 bbls. flour, for A. Young, Georgetown.